Knitting AND Counted Cross Stitch (antique samplers & primitive things)!!! So... I'm thinking about doing what one of my friends used to do ((Faye... love her!)) . She would cross-stitch one day, quilt the second day, and on and on.... don't you think that sounds like a plan? Although.. I know myself VERY well and I know I would get off track. Ok... the "feel good" picture today is hysterical!!! Ready???? Here you go!! 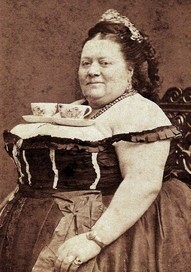 Now that... is a "bust"!!! Wow... isn't it a hoot??? I don't think I would like to carry those gals around with me! My back is killing me...just thinking about it! Tee Hee... I'm sure your hubbies will get a kick out of this photo too! Look at these adorable magnets!!! 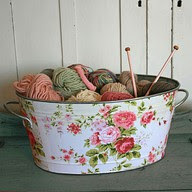 What a fun idea and so inexpensive to make! 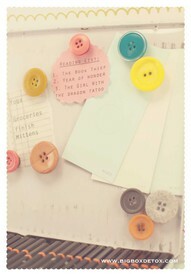 You may already have some buttons around the house..just glue some round magnets to the back of them. You may even want to tie some pearl cotton through the holes (tied in a bow) to give it a little extra "punch" while hanging on the refrigerator. What a fun way for small children to learn their colors too! OR.. choose only those colors that match your kitchen decor (it's all about the presentation you know...). Then... 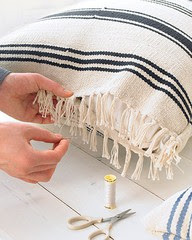 I saw this great idea to make large throw pillows!! These are rugs - you can buy two and sew them together or just one large one - folded in half and stitched together. They are perfect for kids to play on - lay on while watching tv. If you want - you can Velcro them closed - then it will be easier to remove the pillow insert and wash them! Throw rugs like this come in such wonderful colors and designs, they are durable and can add that extra 'zing' of color to a room! Check out places like World Market, Pier I... places that may have rugs with different textures and design!! Ok...all done. My hubby gets so frustrated with me... I'll put a load in the washer and then forget to put them in the dryer... many times having to wash them again. He just doesn't get that... how can I forget? Hello.... he just doesn't live in my head! Now... he DOES help me with the laundry...don't get me wrong... however... HE DRIVES ME NUTS.... when he's folded the clothes (towels, sheets...etc.) he will sit them on the bathroom counter! Leaves them there! Now... here's the issue... the linen closet is right BESIDE the bathroom counter!!!!!!!!!!!!!!!!!!! Why can't he open the door and sit them on the shelf???? See... I also have issues with the laundry! Is any of this sounding familiar to you? Ok... I feel better know that I've shared that with all of you... moving on to a new topic!! Look at these 'long johns' !!! Are they a sight to see??? I read an article... this family hangs them on the line each Christmas... then leaves them all winter long.. lets the snow fall on them... ! Hey...wouldn't this make a cute jigsaw puzzle??? hhmmm... which red piece belongs to which pair??? B-r-r-r-r-r... doesn't it look so cold??? I'm so HAPPY to live in Florida!!! BRB.... my darling hubby has breakfast ready!!! ((30 minute time lapse)) Baaaaccckkk.... that was pretty yummy! Scrambled eggs, bacon and hot tea!!! He fixes breakfast every day... aren't I lucky??? Ok...time for me to get my tush off this computer and get busy!! Take a good look at any artwork you have hanging on your walls, stored in closets, attic, basement... do you really want these pieces any longer? Shaking your head no???? Then donate them to Goodwill or the Salvation Army centers. It's time to let someone else enjoy them like you have!